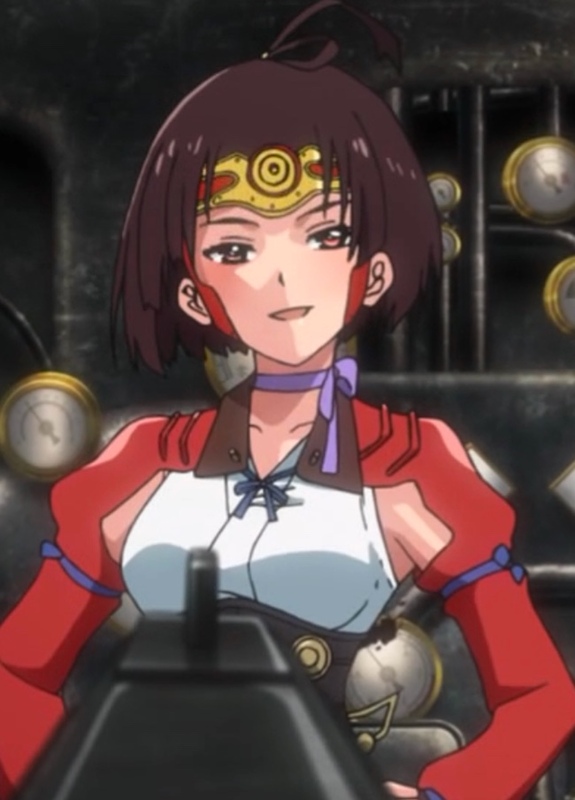 In Prayer Offer, the third episode of Kabaneri of the Iron Fortress, the passengers express their full gratitude to Mumei and Ikoma. In other words, the passengers demand they be killed and thrown off, and not necessarily in that order. Plus, Ayame tries to grow into her leadership role. Mumei and Ikoma agree to stay in the Koutetsujou’s (the name of their train) last car, though Mumei makes it clear she’s just being nice. The steam-smiths discover that the Koutetsujou needs repairs, so they stop at a water tower. There, part of the team effects repairs while the elders and others hold a funeral for all of those who were lost. Some are agitating to throw Mumei and Ikoma off the train; somehow, those people are deluded into thinking they can actually force the two to leave. Meanwhile, Mumei’s training Ikoma to become her human shield to protect her as she naps after intense fighting. When the scared people show up demanding Mumei and Ikoma leave, Ayame tries to dissuade them. It takes Mumei’s show of force to make them pause. Bored, she mingles with the other women as they prepare and share the meal with the other passengers. Ayame confronts Ikoma in front of the agitators in an attempt to prove that he’s not a threat. Unfortunately, two developments, one with Mumei and one with Ikoma, throw her plans into chaos. Not surprisingly, Mumei’s not impressed when Kurusu points his rifle at her. Capture from the Amazon stream. This episode starts right where the last one ended. Mumei’s showing her glowing heart to Kurusu and his men. Kurusu is unmoved and threatens to kill her. Mumei’s about to demonstrate just how fast and powerful she is when Ayame intervenes. The tension’s still high; the men are terrified of Mumei and Ikoma. Still not understanding the situation himself, Ikoma thinks he’s a Kabane and tries to leave the Koutetsujou (the name of their train). Mumei sets the tone for their relationship in this episode by beating him. She then tells the crowd that she’ll stay in the last train car until they get to Kongoukaku, the shogun’s best defended city. This, along with Ayame’s authority, calms things for now. The steam smiths examine the Koutetsujou while it’s in motion. As they’re working, Kajika hands out severely-rationed food. She gives two to a pregnant woman. Kurusu and the bushi know there isn’t enough food, but they think trying to get to Kongoukaku is their best choice. Ikoma regains consciousness after Mumei’s beating, and he learns that she’s on a secret mission for her brother that involves getting to Kongoukaku. After some thought, he’s decided he want to go there, too, because they’re at the leading edge of Kabane research, they might be able to heal him. He’s still not convinced that he’s not a danger to others. To his surprise, Mumei announces that he’ll be her living shield. His objection doesn’t have much effect; he finds himself on his back in response to one of her attacks as she begins his training. As Ikoma’s receiving the beating of his life, Ayame’s receiving a similar political experience. Local leaders demand she throw the “Kabane” off the Koutetsujou; elders demand she stop the train so they can perform ceremonies to commemorate their dead. As she’s trying to maintain control, Mumei thinks she senses a Kabane and chases the sensation to one of the passenger cars. She interrupts a thug trying to take one of the two food packets Kajika gave the pregnant woman. Mumei stops, confused. She sees no Kabane, but she was certain she had sensed one. Of course, most of the passengers ran screaming from the car and attracted the attention of Kurusu and his men, who use the confrontation as an excuse to point their rifles at Mumei and Ikoma again. Trying to defuse the situation, Ikoma promises he’ll make her say in the rear car, but it again takes Ayame to make Kurusu stand down. Immediately, the local leaders try to convince her to let them throw the “Kabane” off the train, and again Mumei taunts them. This time, it took a steam-smith announcing the results of their damage assessment to break the stalemate. There was no way the Koutetsujou was making it to the next station. They would have to stop for repairs. Much like railways in the old United States west, this world has water towers at intervals around the tracks. The Koutetsujou pulled up to one to let the steam-smiths begin repairs. The elders and other passengers begin their religious ceremonies as the bushi take up defensive positions on top of and around the train. During the ceremony, the pregnant woman seems uncomfortable and is sweating. Some of the local leaders begin recruiting for volunteers to help them remove the “Kabane” from their midst. Mumei has so far stayed in the car with Ikoma. They find out both of them lost their families to the Kabane. Ikoma relates how he had lost his sister: their station overrun, the adults feeling in terror, the two of them tried to escape. A Kabane caught her. Terrified, he abandoned her, but feeling ashamed, he came back in time to use a suicide pouch on her. When it came to his sister, Ikoma did what he had to do. But he never forgave himself for it. Capture from the Amazon stream. Before they can finish their conversation, the local leaders arrive and intend to rush the train car holding Mumei and Ikoma. Ayame and a couple of her bushi interrupt them. Mumei’s again more than happy to oblige them if they want a fight. It didn’t help their cause when she jumps dozens of feet in the air and lands before them, the force of her landing alone knocking one off his feet. Again, Ayame pleads for calm, and seeing the men hesitate, Mumei takes a stroll towards where the rest of the passengers are having dinner. Praying near the fire, the pregnant woman feels her heart turn Kabane. She apologizes to her unborn child. The bushi guarding the passengers tell Mumei to halt, and she seems resigned at finding them as jumpy as the others. She asks Kajika for a favor, but before she could say what it was, a baby starts crying. Mumei shocks everyone by making silly faces until the baby laughs. She then hangs out with the other women and seems to blend in. Back at the train, the men hadn’t given up on trying to kill Ikoma. Ayame saw she wasn’t getting anywhere, so she asks Ikoma to prove his loyalty by attacking him with her knife. It pieces his chest, but only slightly; he grasps the knife in his hand, his blood covering the blade. The onlookers breathless, she demands to know why he doesn’t attacked and bitten her. He says he made a vow to never retreat, to never lose another human life to the Kabane. He reminds everyone that the Kabane are the enemy, not him. He reaffirms his mission in life: destroy the Kabane. The group dissipates, its leader clearly unsatisfied. Ayame and Ikoma retreat back into the train car, where she apologizes to him and asks why he let her stab him. He confesses he still can’t control his strength very well; he was afraid he’d break her. She’s clearly touched. As she leaves, she hears him collapse. She sees his hand is still bleeding. Meanwhile, Mumei announces that she’s hungry. Kajika is more than happy to get her a bowl of soup, but Mumei says she needs blood. Suddenly, all of the good will she built up vanishes. Ayame’s trying to stop Ikoma’s bleeding. He rises, his eyes red and hollow like a Kabane’s, and pins her to the floor. 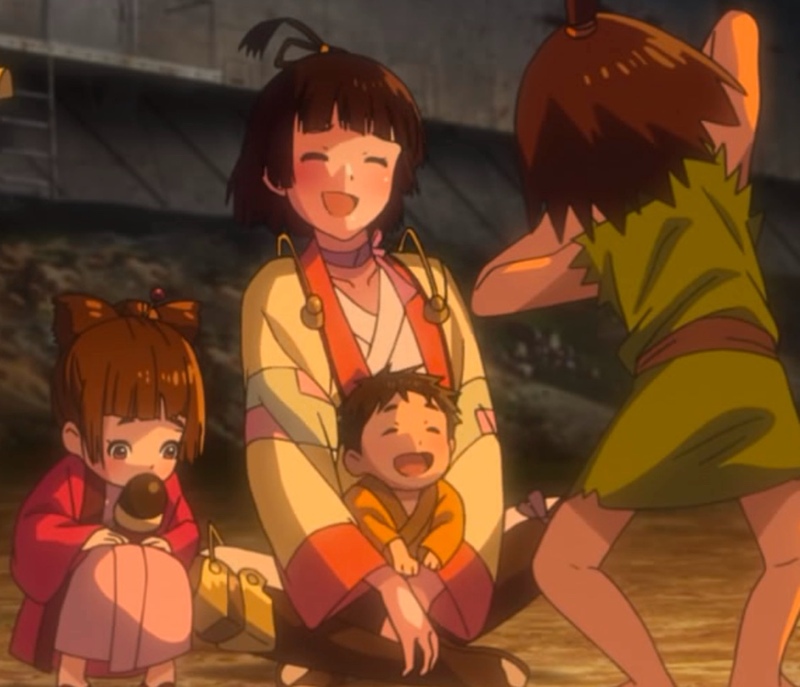 Laughing with the children, Mumei almost seems at like a normal young woman. Then she becomes hungry. Capture from the Amazon stream. Her scream is drown out by the passenger’s screams as they see the pregnant woman has turned into a Kabane. Mumei doesn’t hesitate. Borrowing swords from the two bushi between herself and the Kabane, she buries two blades in the Kabane’s heart. Kajika protests, too late, that the woman had been pregnant. 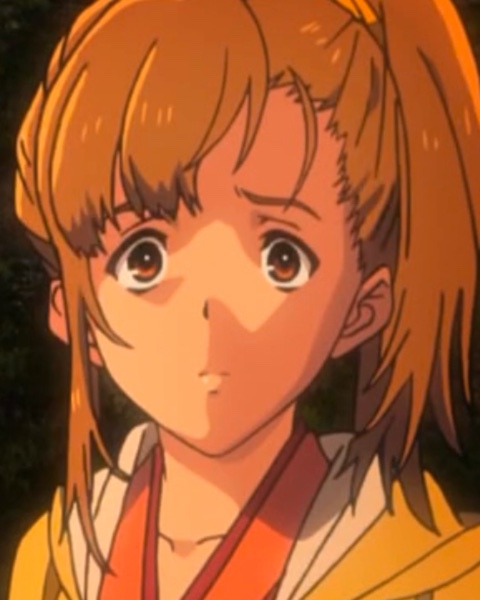 For the first time in this series, Mumei seems horrified. Ikoma lunges for Ayame’s throat. Mumei makes it clear in the opening scene that she’s happy to ride along with them, but she’s not leaving the Koutetsujou regardless. I’m pretty sure she has the strength and moves to backup her threat. I felt sorry for Ikoma. He has no idea what’s happening to his body, Mumei basically orders him to be her living shield, and then she begins “training” him. Her training is nothing more than a series of beatings! I think he’s starting to see the skills she’s trying to impart, but as a teacher, she has no patience. It’s almost like he’s trying to teach her to be a teacher. When the Koutetsujou pulled up to the water tower, they got off on a side track that circled the tower. The effect was that the armored train turned into a steel wall, and the people could disembark in the middle with relative safety. I thought that was a cool detail. After Ikoma told her the story of how he had lost his sister, Mumei reflects that it was just another story of the strong surviving and the weak dying. There’s no condemnation in her voice. She wasn’t belittling either his experience or hers. She seems resigned to the way of this world, and at the same time, she’s determined to thrive in it. I like her practical attitude. 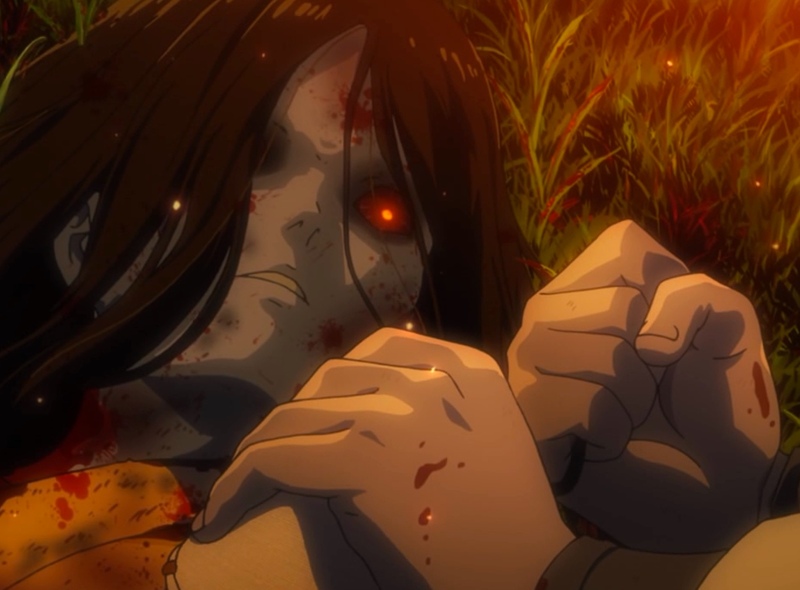 It might be cliche from the broader perspective, but I thought Ikoma’s story about how he lost his sister was effective, especially as an explanation of his extreme conviction to kill the Kabane. I enjoyed seeing Mumei play with the children. She surprised everyone by not just eating the child, I think! Those scenes also built up a sadness, too, because I knew those light-hearted and kind episodes couldn’t last. Ayame showed a lot of courage and resolve — not along political astuteness! — when she turned her knife on Ikoma. Up until then, I was starting to fear she’d be a one-dimensional leader; always demanding patience, but never really resolving the issues in front of her. In that moment, though, she showed that she has what it takes to lead the Koutetsujou. And yea! Another strong female character! Kajika half-heartedly protests that Mumei should stay her blade; yet she knows what must be done. Capture from the Amazon stream. When the women turn on Mumei for announcing she’s hungry for blood, one of them throws a rock at the Kabaneri. Mumei dodges it without any visible effort. She’s not mad at the women for cursing her; she doesn’t seem anything but pleasantly tolerant, in fact. But she insists that she needs to eat, and the only thing that’ll satisfy her hunger is blood. I wonder: does she need to bite someone, or could someone donate blood for her? Though macabre, it seems like an equitable trade. Mumei’s protection for an occasional blood donation. When Mumei knocked Ikoma unconscious, I clearly saw his glasses laying next to him. When he woke up, he was wearing them again! Mumei doesn’t seem the type to do something that considerate, so how’d they get back on his face? Are they magic glasses? Or — even more unbelievably — did Mumei do something considerate! Mumei’s a fascinating character. She’s by no means cruel. She’s just blunt and direct. At the same time, she’s not the type to pamper or even encourage others. It looks to me that she’s accepted the mantra that the weak die and the strong live to the point she feels like a spectator, just watching others demonstrate their strength, or their weakness. She’ll enjoy making a child laugh, but in the next minute, I’m not sure she thinks she’d mourn over that child’s death if the Kabane attacked. She’s certainly trying to impress that approach on Ikoma. When she realized she had just killed a Kabane who had been a pregnant woman, what did that stricken look on her face mean? Is there something more to her past that she hasn’t let on? Is there still some sensitivity to the plight of others lurking beneath her polished and impenetrable exterior? I’ve built up enough trust in the creative team to say that I’m looking forward to finding out!